The fusion program is part of the Euratom agreement and its activities are carried out in Italy by ENEA, as coordinator, by CNR and by many Italian universities and industrial partners. In this frame European Union and Japan launched a research and development program, called Broader Approach (BA), to sustain and complement the international effort to build the International Thermonuclear Experimental Reactor (ITER). 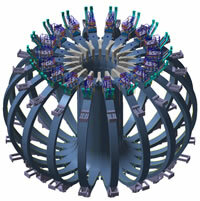 This BA cooperation agreement includes the construction in Japan of the large superconducting tokamak JT-60SA aimed to develop operational scenarios relevant for ITER (International Thermonuclear Experimental Reactor )and DEMO, the construction of facilities to test components to be adopted in the research machine IFMIF (International Fusion Material Irradiation Facility) aimed to study the material damage caused by high energy neutron flux generated in fusion reactions, the construction of a prototype of the liquid lithium IFMIF target and the creation of the International Fusion Energy Research Center (IFERC) including a center for advanced materials development and a supercomputing center. 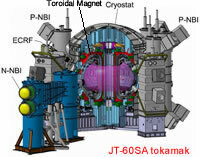 The JT-60SA tokamak will be built in Naka, Japan, re-using existing torus hall, infrastructures and subsystems of the former JT-60U experiment, as much as possible. SA, as "super advanced", refers to the use of Superconducting Coils Magnets (SCM) and to the study of advanced modes in plasma operation. It is a large (major radius about 3 m) fully superconducting tokamak capable of confining break-even equivalent high density deuterium plasmas with 5.5 MA maximum current, providing full non-inductive steady-state operations in pulses long up to 100 s and allowing a significant thermal power flux on the divertor. The main upgraded components are basically a 41 MW heating and current drive system, a target divertor able to withstand up to 15 MW/m2 heat flux and a fully superconducting magnet system with relevant cryogenic plant and power supplies, including 18 Toroidal Field (TF) coils, 6 Equilibrium Field (EF) coils and one Central Solenoid (CS) subdivided in four stacked solenoids. The voluntary contribution to the JT-60SA project from ENEA comprises the design, manufacture and test of 9 NbTi superconducting TF coils winding pack, 18 stainless steel TF coils casing to enclosure the Winding Pack, part of the CS and PF Power Supply and Switching Network Units. Controlled thermonuclear fusion is a very real option for a reliable source of energy, environmentally friendly and virtually inexhaustible. Europe, China, South Korea, India, Japan, Russia and the United States have joined their efforts in a very impressive project, ITER (International Thermonuclear Experimental Reactor), which represents a fundamental stage to demonstrate the capability of producing net power and the ability to maintain the reaction for long enough. The system will also check the relevant technologies for the reactor and provide useful elements for the design of first demonstration fusion reactors (DEMO). 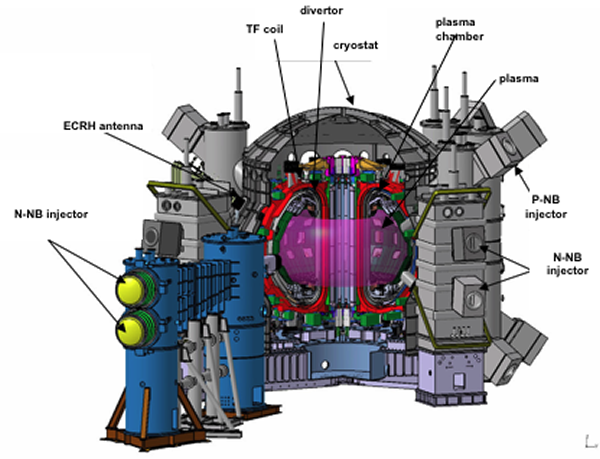 The fusion research requires a strong effort to develope the plasma physics and the technologies related to the materials and manufacturing processes of components faced to high thermal loads, relevant electro-magnetic forces and serious neutron fluxes and required to be remotely maintained. To take full advantage of ITER experimentation Europe and Japan have decided to launch a parallel program called Broader Approach (BA) to complement ITER. the creation of the International Fusion Energy Research Center (IFERC) which includes the development of advanced materials for DEMO such as SiC / SiC and the construction of a supercomputing center. 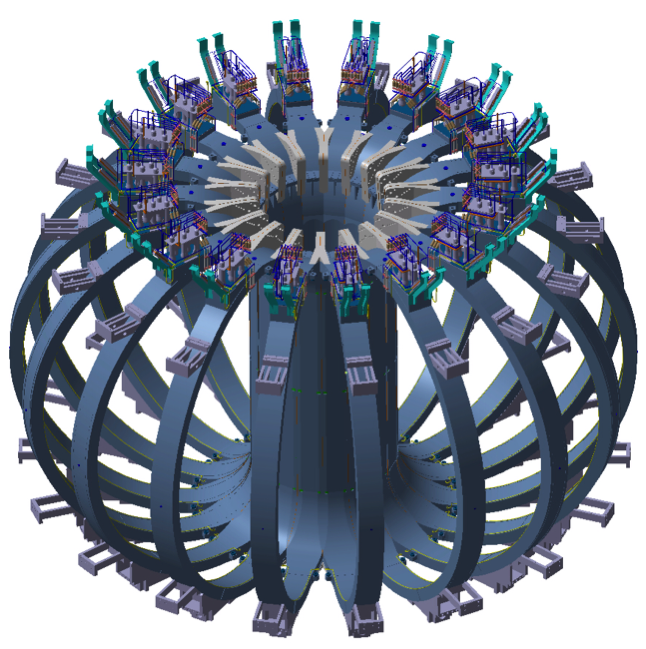 The JT-60SA Tokamak will be built in Naka, Japan, using existing torus hall, infrastructures and subsystems of the former JT-60U experiment, as much as possible. SA, as "super advanced", refers to the use of Superconducting Coils Magnets and to the study of advanced modes in plasma operation. It is a large (major radius about 3 m) fully superconducting tokamak capable of confining break-even equivalent high density deuterium plasmas, allowing significant thermal power flow on the divertor. JT-60SA has been designed (Fig. 1) to make available plasma equilibrium configurations covering relatively high plasma shaping with a low aspect ratio A~2.5, with single or double null configurations and a maximum plasma current Ip=5.5 MA; in addition it is able to provide full non-inductive steady-state operations at high values of the plasma pressure. The main scope of JT-60SA operation is to explore the steady state plasma regimes in high-beta configurations, reaching long-pulse duration domain with 100 second-long plasma pulse. 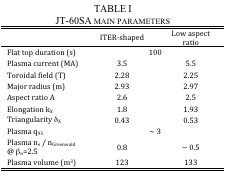 The reference scenarios include ITER like configurations and the main relevant plasma parameters are shown in Table 1. 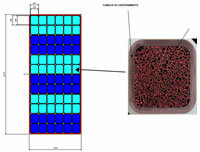 The main upgraded components that are contributing to reach and sustain those extreme conditions are basically a 41 MW heating and current drive system, a target divertor able to withstand up to 15 MW/m2 heat flux and a fully superconducting magnet system with cryogenic plant and power supplies. This magnet system includes 18 Toroidal Field (TF) coils, 6 Equilibrium Field (EF) coils and one Central Solenoid (CS) coil subdivided in four stacked solenoids. The machine is designed to allow at least 6000 pulses in full operation and 12000 in reduced performances conditions. Design and Procurement is carried out by Implementing Agencies, JAEA in Japan and Fusion for Energy (F4E) in Europe. Project Team is supervising the technical design and procurement activities conducted within the EU Voluntary Contributors and JA Home Teams. ENEA is responsible for the procurement of 9 TF coils, their delivery to the Cold test facility, the manufacture of 18 casings and their delivery to the two suppliers in charge of the coil integration and part of the power supply system. The design request for a plasma pulse lasting about 100s compel the adoption of superconducting magnets, since traditional conductors as copper would lead to high thermal stresses and high after-pulse temperatures and cooling times of the magnets. Superconducting materials were adopted in the whole JT-60SA magnetic system: NbTi in the 18 Toroidal Field (TF) coils, which will operate mainly in steady state (Fig. 2); Nb3Sn in the 4 modules composing the Central Solenoid (CS) required to induce the plasma current, which will operate in a variable current regime; NbTi in the 6 Equilibrium Field (EF) toroidal coils providing the poloidal field required to stabilize the plasma. The 18 TF coils are composed of a winding pack wound from a rectangular steel-jacketed NbTi a cable-in-conduit conductor (CICC) and embedded in a steel casing. The winding package is composed by stacking of 6 double pancakes, each pancake having six turns. The double pancakes, each in a single conductor length, are electrically connected by joints at its end. Each conductor, optimized to reduce the risk of rapid transition (quench) and improve the inherent stability, has a 25.7 kA nominal current and is cooled by a forced flow (4 g/s) of supercritical helium at 4.4 K in proper channels. The winding package is then wrapped in a layer of ground insulation and vacuum impregnated with epoxy resin. The first and last terminals of the side double pancakes will be connected to the feeders during machine assembly. Six helium inlets are welded to the jacket at the mid-point of the double pancake. 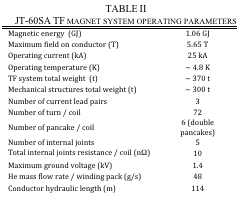 The main TF magnet system operating parameters are shown in Table 2. Table 1- JT-60SA main parameters. Tabella 2 –JT-60SAtoroidal coil specs. The whole winding package of the coil has nominal dimensions of 345 mm (toroidal) and 150 mm (radially) and is contained in a AISI austenitic steel casing, which is the main structural component of the magnet system and is characterized by strict geometric tolerance limits to ensure a proper positioning of the coils and to provide mechanical support for the magnet system. The TF coil casing is composed by plates, with thickness in the range 15-100 mm. The production of the TF coils requires the development of innovative prototype systems and equipment, both for the development of constructive solutions and for the definition of the manufacturing procedures. 9 of the 18 TF modules will be provided by ENEA and 9 by CEA. ENEA will also provide all the 18 coil casing. Fig.3 - Toroidal Field coil section The cable (Fig. 3) will be provided by Europe (F4E) and is designed to ensure a minimum temperature margin of 1.2 K in normal operating conditions and 1 K after a full plasma disruption. The superconducting strands consist of 324 NbTi filaments embedded in a stabilizing matrix comprising 162 copper wires (to ensure the transport of current in case of transition of the superconductor) surrounded by a resistive barrier needed to control the inter-strand coupling currents while allowing current redistribution. 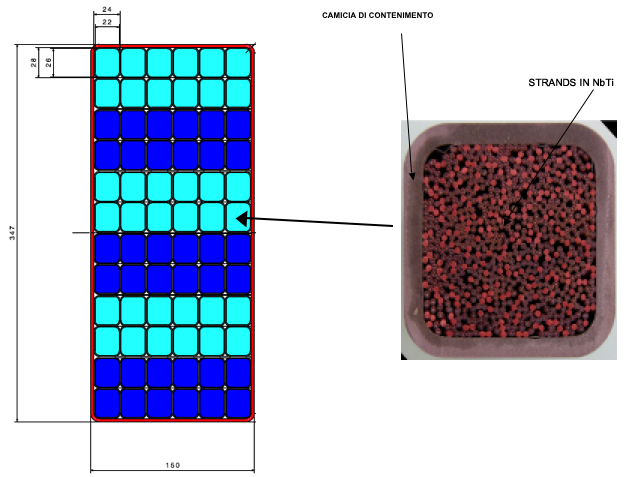 The analysis of the conductor nuclear heating, neutron flux and dose in the insulating layer was carried out by ENEA with the Monte Carlo code MCNP-5 on a 20° sector 3D model of the machine (Fig. 4), assuming properly homogenized materials and considering an extended plasma source with an emission of neutrons produced by DD reactions (En = 2.45 MeV) equal to 1.5·1017 n/s. The maximum nuclear heating values in the coils, about 0.31 mW/cm3 (0.45 mW/cm3 in the steel casing and 0.12 mW/cm3 in the insulating layer), were used to perform the thermo-hydraulic analyses (with the 1D finite element code Gandalf and the 2D code ABAQUS) and to design the cryogenic plant. The total power to be removed from the helium is 7.98 kW (3.1 kW from the coil, 4.7 kW from the steel casing and 0.27 kW from the insulating layer), considering a 1.5 safety margin. The dose expected in the insulating layer at the end of the machine life (10 years of operations) is so low (<20 kGy, assuming a 1.8 safety margin) to exclude the need to replace the component due to the radiation induced damage. ENEA has also conducted an analysis, with the code Gandalf, to evaluate the maximum pressure inside the coil in the fast transients (quench) induced during cold tests performed to its final acceptance. Two samples of the NbTi conductor to be used for the TF coils were produced and tested by ENEA, in the Swiss laboratory SULTAN, in operating conditions. A structural analysis of the TF coil was performed, by the finite element code ANSYS, on a full 3D model taking into account the electromagnetic loads produced during the reference scenario. The maximum shear stress is acceptable both in the insulating layer (18 MPa) and in the insulation to ground (10 MPa). The stress distribution in the structural part of the TF coil reaches a peak of about 400 MPa in the inside leg, below the AISI 316 acceptable limit. 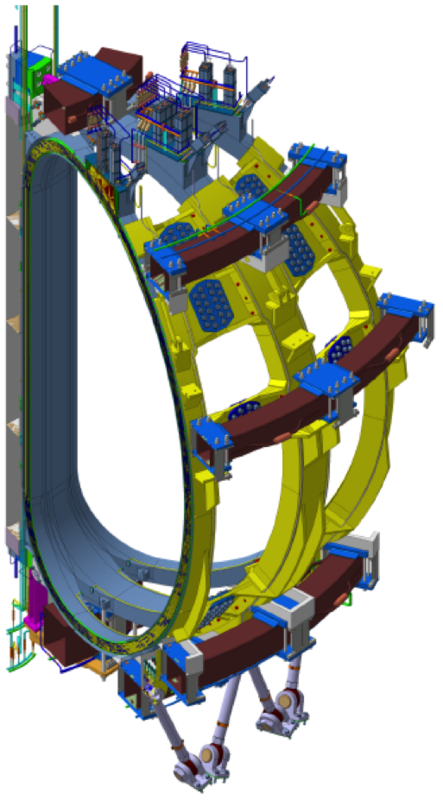 The interfaces among the components were analyzed by developing a CAD model of the coil and austenitic steel casing. The new Superconducting Coils Magnets (SCM) will require a devoted Power Supply system (SCMPS), which design has been mainly driven by the need to re-use as much as possible actual JT-60U power supply system, to allow coil current regulation mode and to protect the SCM in case of quench and fault to ground. TF coils are divided in three sections connected in series with one Power Supply (PS) unit and three Quench Protection Circuits (QPC) to allow limiting the voltage across the TF coil sections to 2.8 kV at the 25.7 kA nominal current. Each one of the four CS and six EF coils is fed by a system including a 12 pulses / 4 quadrant thyristor converter and a Switching Network Unit (SNU) to generate the required voltage step at plasma breakdown. Each SNU is composed by a hybrid switch able to interrupt a dc current up to 20 kA and to commutate it into a set of adjustable resistors in order to generate a voltage step of 5 kV.